Kit’s search begins with his onetime stepfather, Jasper, a take-no-prisoners Vermont outdoorsman, and ultimately leads him to Fenno McLeod, the beloved protagonist of Glass's award-winning novel Three Junes. 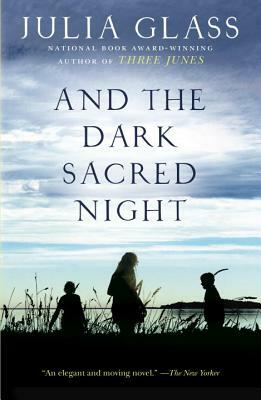 Immersing readers in a panorama that stretches from Vermont to the tip of Cape Cod, And the Dark Sacred Night is an unforgettable novel about the youthful choices that steer our destinies, the necessity of forgiveness, and the risks we take when we face down the shadows of our past. Julia Glass is the author of Three Junes, winner of the 2002 National Book Award for Fiction; The Whole World Over; I See You Everywhere, winner of the 2009 Binghamton University John Gardner Book Award; and The Widower’s Tale. Her essays have been widely anthologized. A recipient of fellowships from the National Endowment for the Arts, the New York Foundation for the Arts, and the Radcliffe Institute for Advanced Study, Glass also teaches fiction writing, most frequently at the Fine Arts Work Center in Provincetown. She lives with her family in Marblehead, Massachusetts.